I wanted to cry when I got your dear letter because it all sounded so perfect and so just what I've longed for and yet so impossible to carry out. Lovely things like that are just too nice to happen, I'm afraid. You see, before your letter came we had already signed the lease for a little house at Blue Ridge Summit, just about seventy-five miles from here. I had given up all hope of Cornish after the declaration of war, because then I knew that Mac couldn't leave Washington all summer, except now and then for Sundays, and Cornish is too far away for that. And so, Blue Ridge is the only near-by place that is at all possible and I had no choice either. I couldn't leave Mac alone all summer when he is under such a frightful strain. So we settled it, all of a sudden, just last week. It is really heart-breaking to think what, any other year, might been—the thing I have wanted so terribly—to spend the summer near my darling sister and her babies. I do hope that your heart wasn't too much set on it, darling, I mean that you weren't really expecting it too much, because I hate to have you badly disappointed. If you are as disapointed as I am it will hurt you—I have a pain in my heart right now. My only comfort is that, perhaps next summer, if this horrible war is over and you and Frank like it at Nantucket and want to go there again we can really work it. It would be heavenly. You might go there again, mightnt you? It sounds like a perfectly adorable house place and the house you thought of for us sounds really sweet. Do forgive me for not writing at once. I have tried every day but have been simply overwhelmed by all the festivities and so forth for the two commissions (spelling?). I have given one big dinner myself and have to give another on Saturday and that for poor little inexeperienced me means heaps of work. To-night we go to the White House to meet Viviani and General Joffre and the French commission, and I am very much thrilled at the thought. It is all tremendously thrilling—having the English and French here—and meeting and talking to them, for it makes me feel as if we really were active partners with them in the great cause. Balfour is delightful with such a sweet, kindly expression and a quiet way of talking that is most attractive, and the rest of the group are delightful too, especially General Bridges is who is the most decoratively handsome man I have ever seen! General Joffre looks just like his picture, only a little fatter—You should have seen the reception he got yesterday—the streets were lined four deep with people all the way from the Navy yard to the house they are to live in near the French Embassy, and I have never heard Washington crowds so enthusiastic. I jumped and waved and made a noise myself and so did Mac. I wish you were here precious Jetty, to see it all too, for it's wonderfully heartening—the sort of thing I need to keep up my enthusiasm, for its very hard to see Father and Mac so hard pressed and with such terrific loads to carry. I worry all the time about Mac, for I have never seen anything so terrific as the work he has to do. I can always write just so much to you and then something stops me—I've got to run now to keep an engagement. Good-bye darling and thank you for your sweet sweet letter. If it could only have been—With adoring love and to you all—and a thousand thanks for sending Ellen the little dress. It hasn't come yet, but I know that anything you send will be lovely. But you know, you shouldn't send things like that darling,—just a little toy—to show that you are thinking of her would be more than enough—You are too dear. Please let me send Eleanor something else—I'm going to—so there! 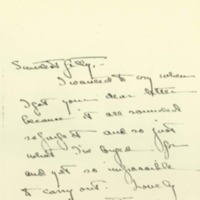 McAdoo, Eleanor Wilson, 1889-1967, “Eleanor Randolph Wilson McAdoo to Jessie Woodrow Wilson Sayre,” 1917 April 26, WWP17543, Jessie Wilson Sayre Correspondence, Woodrow Wilson Presidential Library & Museum, Staunton, Virginia.